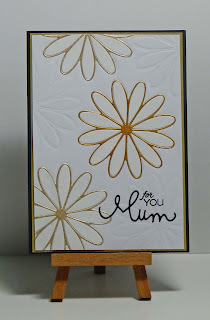 Cathy's Card Spot: Embossing with wafer dies. Hi everyone, I've tried a new to me technique on this card, embossing with a die. It has a lovely quilted feel in real life. I also used up leftover negative and positive pieces to make the flowers. I didn't have enough to cover the card, so that's why I thought I'd try the embossing to balance out the design. 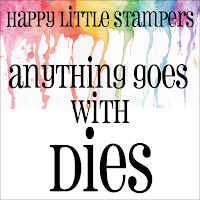 I'm linking up to the Happy Little Stampers anything goes with dies challenge. I've used Memory Box tilth floral and Simon Says Stamp Mum dies. At Outside the Box the theme is celebrating Mum. You also need to use a Memory Box product on your project. At CAS mix up card challenge one of the elements needed in inlaid die cutting. 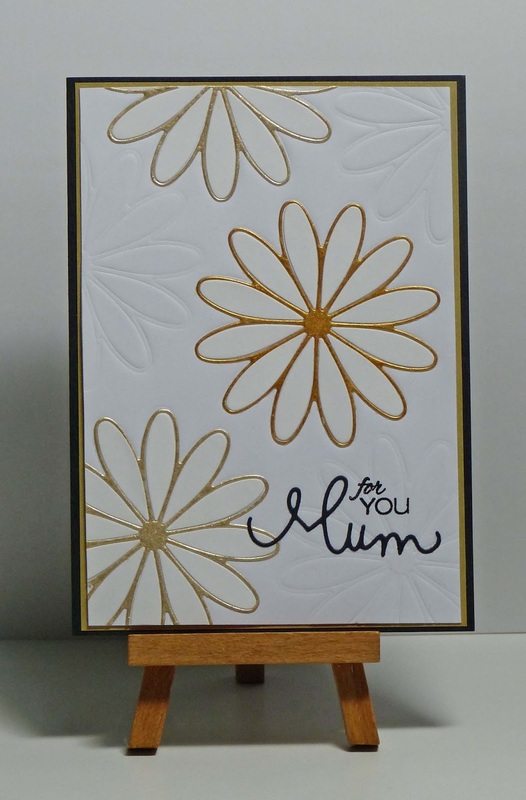 After embossing the card with the die, I glued the negative flower shapes in place, then glued in the petals. The flowers were leftover from another project where I'd diecut them from card painted with Finetec gold watercolours. I've also stamped the tiny for you sentiment. Memory Box tilth floral and Simon Says Stamp mum dies; Finetec gold watercolour paints; Casual Fridays Mum's the word stamp; versafine ink & clear ep. I love the embossed flowers that perfectly balance the inlaid die cut ones! The gold adds such elegance! A superb card, Cathy! Thanks so much for sharing this with us at CAS Mix Up! Thanks for giving me a new idea what to do with this die! The embossing adds a nice subtle background! Love it! Such a pretty spring time CAS daisy inlaid design. TFS Cathy and joining us at CAS Mix Up. hugs..
Oh my, this is gorgeous! Love the simplicity and the spark of gold. A lovely CAS card. I like how the embossing gives texture to the card and fills the card but keeps it CAS. Great design Cathy! The dry embossed flowers work so well in-between your pretty gold die-cut blooms. Awesome technique! Thanks for sharing with us at CAS Mix Up! A very pretty result and great use od dies! You may be new to the technique, but the card turned out fantastic! Thank you so much for participating our April challenge and for supporting Memory Box.